Hello beautiful people of Don Antonio Heights in Quezon City! Are you aware of the new hand and foot Spa in the neighborhood? If you don't know it yet, then celebrate because the affordable Nails.Glow Manicure and Pedicure is now available at Don Antonio Heights in Quezon City. Yes, it's good news indeed for everyone in the neighborhood. They invited several bloggers to try their services for free. I arrived at around seven in the evening. They asked me to list down the services that I wanted to avail. I wanted to have facial, candle ear wax and body massage but they gave me free Hand and Foot Paraffin treatment instead. I think they have the same price at Nails.Glow. They melted a candle wax then dip my hands on the hot liquid then wrapped a plastic and gloves on both of my hands. It was virtually the same procedure with the Foot Paraffin. I enjoyed the hand and foot paraffin and will surely try that again another time. At around 11 p.m. they finally gave me a body massage. 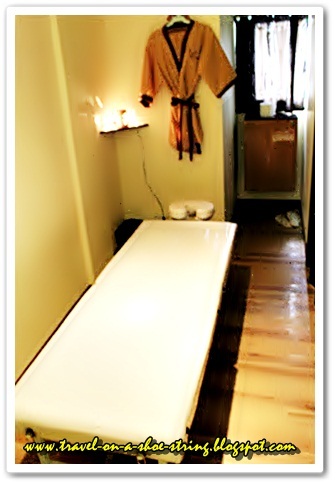 Here is the massage room. "Enjoy the STAY, experience the GLOW" only at NAILS.Glow, your neighborhood hand and foot spa located at 18 Don Jose St., Don Antonio Heights, Quezon City, owned by the very amiable owner Tiffanie Cheng. Imagine, at fraction of the cost, you get better service and better value for your hard-earned money. Check them out @ the Northgate of Don Antonio Village where NAILS.Glow seeks to provide only the best in all its services, housed in a modern zen haven, promising a very relaxing and satisfying stay, all at very affordable and "pang-masa" rates! If you will be commuting, just alight by the pedestrian overpass near Ever Gotesco, then cross via the pedestrian overpass and walk your way to the northgate of Don Antonio Villa. Voila! You'll see that signage at your right side.